This is as close to feeling like JK Rowling as I’m ever likely to get. It’s a dreich ole day and I’m sitting in a local coffee shop awaiting a steaming latte. The rain is pounding off the glass roof and streaming down the windows as I type away and I am glad to have escaped the baltic conditions of our house. You see, the man came to service the boiler yesterday and well, broke it. Not a cheep out of it and with temperatures plummeting, the desire to walk the streets with my laptop seeking warmth and coffee has surfaced with a vengeance. What did you think of The Match? The Tiger versus Phil shoot-out in Las Vegas (where else?) for a winner-take-all $9 million dollar purse? Did you rejoice when televisual technical difficulties meant the pay-per-view idea had to be abandoned and live, free, streaming occurred at the eleventh hour? Why, joy of joys, we were even able to watch it here in England on Sky. Are you holding your breath waiting to see if there will be sequel, a Match No 2? Frankly, I thought this attempt to move golf into the entertainments and gambling industry, with only a small, select VIP audience present at Shadow Creek Golf course, was ill conceived and a new low in the coverage of our sport. Two sportsmen at least a decade removed from their primes is not the stuff of the box-office and, with woeful performances from the pair on golf’s greatest stage, the Ryder Cup, still fresh in our minds, (a combined zero points contributed to the US cause at Le Golf National), is it any wonder many of you probably weren’t even aware The Match was taking place? Believe me, you missed nothing. Of course, various charities and the foundations of the two protagonists will benefit and golf is prodigious in its support of good causes, but don’t let that cloud the issue. It is difficult to see this contrived spectacle as anything other than a crass lining of the pockets of two individuals, already fabulously wealthy beyond the imaginings of most of us. They both still crave the limelight their golf no longer merits. This is a match best forgotten. Tiger & Phil with the $9 million up for grabs. Crass…and classless. By contrast, I well remember the early TV matches between The Big Three – Jack Nicklaus, Arnold Palmer and Gary Player – and the excitement with which we followed every shot. This was promoting golf at its best – players at the peak of their skills, fire in their bellies seeking victory and grace and good sportsmanship in defeat. The banter between them was uncontrived and we had the feeling we were simply eavesdropping on a match between three giants of the game. And, as well as tussling for bragging rights and a financial pot, all three were invested in bringing the game to more and more people and showcasing the sport in the best possible way. There is much talk at the moment about the declining interest in golf compared to other sports. We live in an izzy-whizzy, fast-paced, low-attention-span, instant-gratification world and golf is deemed to be too slow, too ponderous and too boring to engage the masses. This is partly responsible for the simplification and streamlining of the rules from next January onwards; the introduction of new formats such as Golf Sixes on the professional stage; and the emphasis that nine holes is fine and we all have time for that, if not for a full round. These are laudable schemes and will, hopefully, help to attract new players and new fans. After all, every sport must be prepared to adapt or die, but, please, please do not underestimate the masses. We do not need to dumb golf down to the lowest common denominator thus losing so many of its nuances and challenges. There has never been anything much wrong with the game itself and it will continue to beguile and enthrall future generations but only if those of us who play it are more welcoming, accommodating and modern in our approach. We need to eradicate intimidating golf clubs, pompous attitudes and ridiculous dress rules – some of the real reasons the sport isn’t growing as it should. The game is fine….it’s some of the people who play it who are not. As with most things, balance is the key. So please, no more Tiger-Phil match-ups outside of regular tournament play. As he so often does, Rory McIlroy summed it up succinctly, “If they had done it fifteen years ago, it would have been great, but nowadays it’s missed the mark a little bit.” Quite. Now, time for another latte. I think it was the BBC’s Iain Carter – like Mo no fan of the Woods v Mickelson boost for Gamblers’ Anonymous – who mentioned that the World Cup of Golf was overshadowed by the over-hyped PGA Tour-sanctioned shindig in Las Vegas. Well, in recent years, the World Cup has tended to limp along in the shadows whatever else has been going on. The competition, which started in 1953 as the Canada Cup, at Beaconsfield in Montreal, was won by Roberto de Vicenzo and Antonio Cerda of Argentina and the following year, at Laval-sur-Lac, also in Montreal, Peter Thomson and Kel Nagle of Australia won. In 1955, with home advantage, the United States won for the first time, represented by Ed Furgol and Chick Harbert. The USA triumphed again in 1956, at Wentworth, with the more legendary pair of Ben Hogan and Sam Snead wowing large galleries. And, of course, in 1958, in Mexico City, Harry Bradshaw and Christy O’Connor won for Ireland. As far as I could see, this year’s event, officially called the ISPS Handa Melbourne World Cup of Golf, was not listed in the European Tour’s media guide but, fortunately for me, all the results were and the names on the immense trophy include some of the greats of the game – Palmer, Nicklaus, Player, Trevino, Ballesteros, Faldo, Els, Woods. In Hawaii, in 1987, Wales won with David Llewellyn manfully supporting an imperious Ian Woosnam. They beat Scotland, represented by Sandy Lyle and Sam Torrance, in a play-off. Llewellyn, known as Lulu, could play a bit and should have become the first man to break 60 on the European Tour, as long ago as 1988, but three-putted the last at Biarritz. There was a new name on the trophy this year, with Belgium winning at The Metropolitan Club in Melbourne. 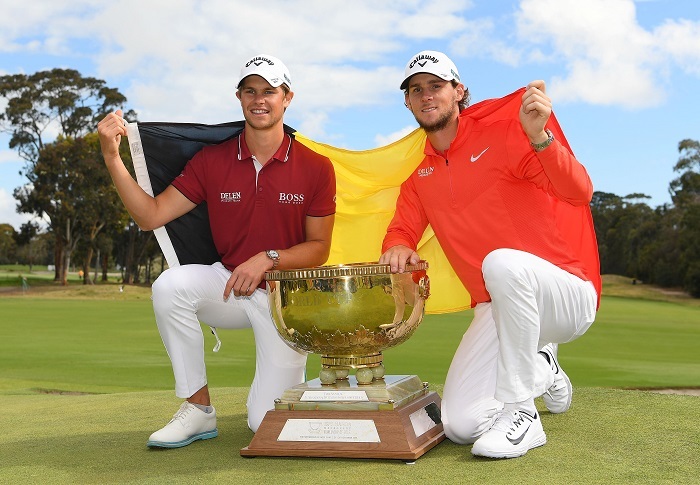 Thomas Pieters and Thomas Detry held off Australia (Mark Leishman and Cameron Smith, supported by a huge crowd) and Mexico (Abraham Ancer and Roberto Diaz), to win by three shots. This year the format was two rounds of fourballs and two rounds of foursomes and I have to confess that over the years covering the World Cup was not always the most exciting gig. Watching the Scots one year in Florida (I was the Daily Record’s Dale Rankin No 302, or thereabouts; if their own man wasn’t there, the bod sending in the golf copy was given the byline Dale Rankin) and the most noteworthy thing was a chat with Jim Milligan, the quiet Scot who’d helped GB and I win the Walker Cup at Peachtree and was on his holidays. I think that was the year that I also had to do The Times unexpectedly and Ian Woosnam ended up writing to the sports editor to complain that he had not, as I reported, been up until three in the morning playing the piano. It turned out to be a combination of rushed writing, changing editions and inexact sub-editing and Woosie was mollified by a bit of grovelling on my part and some nifty diplomacy by the golf correspondent. I finally cracked how to cover the World Cup when I was doing the Scots again, in Italy this time and they were playing uninspired stuff, well down the leaderboard and losing interest by the stroke. We were staying in Rome, about an hour’s coach journey from the course, which was pretty well in the middle of nowhere and some people moved out of Rome to cut out the commute. It was worth every second on that coach to be able to enjoy Rome and one morning Dai and I joined Kaye Kessler (read his stuff when you get the chance) and his wife Roe on a memorable tour of the catacombs, guided by an ebullient priest from somewhere like Hong Kong. If memory serves, we had a delicious lunch and hitched a lift in a courtesy car summoned by the formidable and well connected Kesslers (distinguished Americans merited priority treatment), arriving at the golf course just as the Scots were approaching the 18th green, five or perhaps nearer six hours after they’d started. Perfect! Even better, I managed to intercept one of the Scots as he legged it out of the scoring hut by the back door, trying to evade having to say anything at all about their dire performance. Oh happy days! 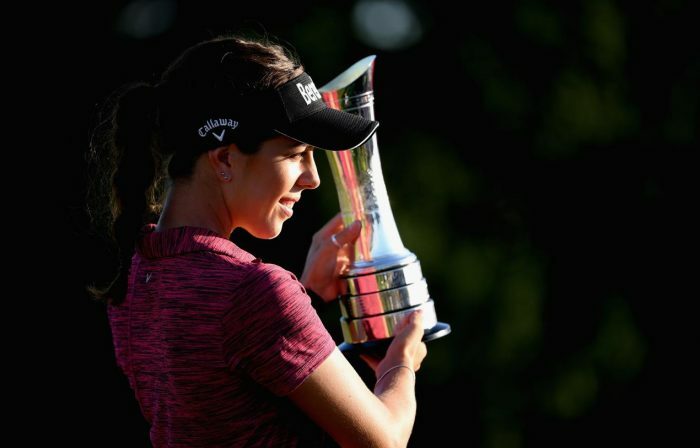 No jetting off to Australia, Hong Kong, Mauritius, the Bahamas, Vegas, or wherever for me these days but I’m hoping to be at Woburn next year to see Georgia Hall defend her Women’s British Open title. Ricoh have finished their stint as sponsors and yesterday it was announced that it’s now the AIG Women’s British Open, with American International Group, Inc (NYSE: AIG) becoming the title sponsor for the next five years at least. AIG is a leading global insurance organisation (I quote the press release but prefer organisation to organization) and this is the company’s first title sponsorship in professional golf. More on this all, no doubt, in due course but let’s welcome what I hope will be good news for women’s golf worldwide. 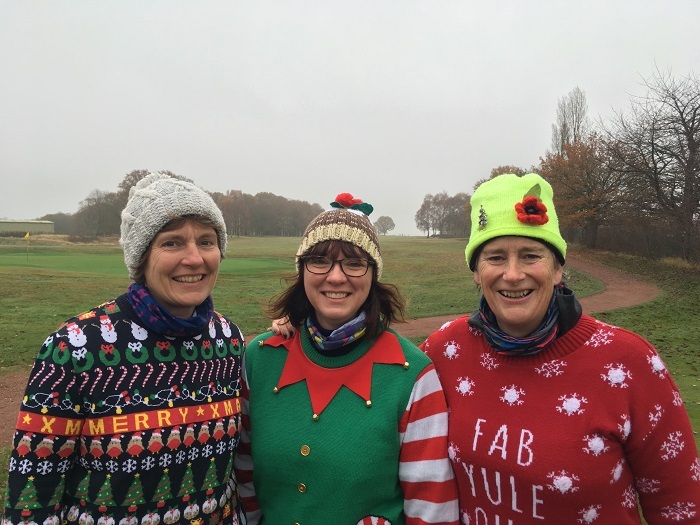 Meanwhile, lower down the swinging order, it was Christmas jersey day at Whittington and I leave you with one trio’s offering. We got 13 holes (the designated number at this time of year) in before it started lashing with rain and didn’t have to cover our jumpers with waterproofs. 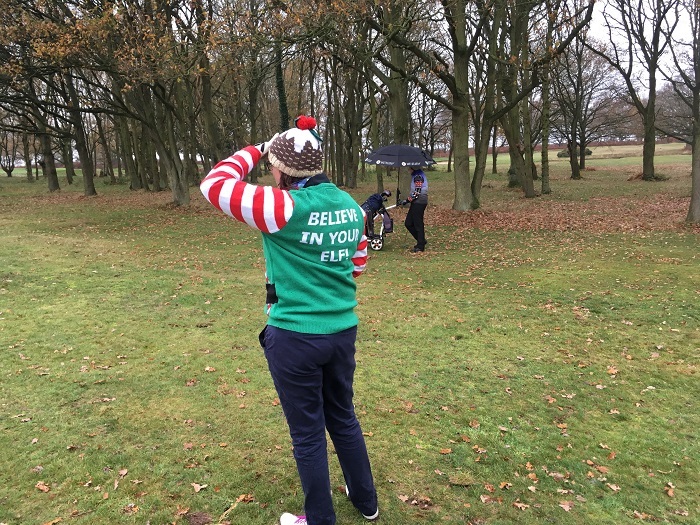 Golf for all: the elf experiences the vagaries of golf. Note the toque.